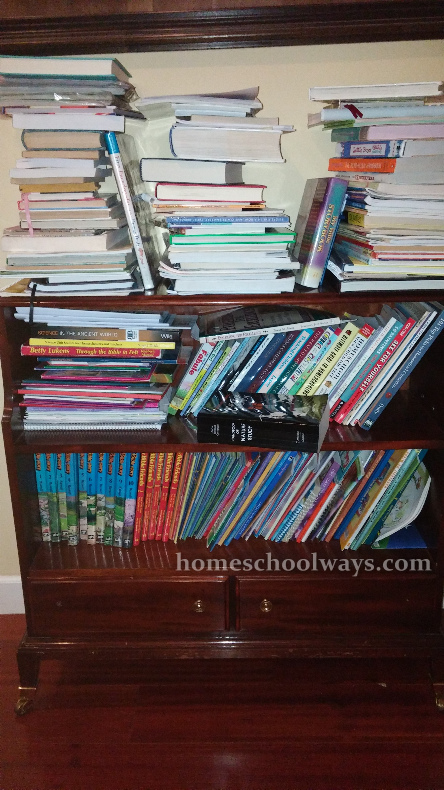 According to my umbrella school coordinator, homeschooling moms should keep themselves fresh by reading at least one or two books – an in-service for homeschool moms per year. Take 30 minutes in the morning, before your household wakes up, and read these books to strengthen your outlook on homeschooling. At some point, you will want to start reading the classic books of Western Civilization, if you have not read them before children (see #1 and #4 below). Please note that I am an Amazon affiliate. Here’s a link to my aStore with all the books listed below. One of my bookshelves, in dire need of organization. A helpful list-thank you. I’m convinced that we all need some in service training!